Every year, nearly 800 people of all ages and their families gather to live together and receive diabetes education. 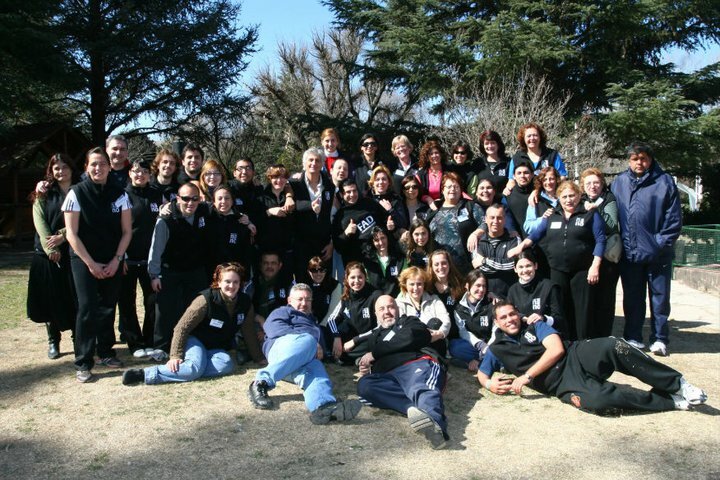 Every year, over four consecutive days, nearly 800 people of all ages and their families gather to live together and receive diabetes education at events organised by the Federación Argentina de Diabetes (FAD) (Diabetes Federation of Argentina). Why do people with diabetes who have received treatment information and know what they have to do for adequate management of their disease, fail to achieve their therapeutic goals? What leads them to seek education if they fail to use insulin as required, to adhere to their meal plans, to engage in physical activity and to self-monitor their blood glucose? Why, if there are a wide range of choices in the pharmacologic arsenal, self-monitoring methods that become more and more comfortable, and so many ongoing educational programs in diabetes, is the achievement of therapeutic targets so low? Perhaps the answer to all these questions lays originally with the physicians’ intimate belief in the value of pharmacological approaches over non-pharmacological ones, with the latter barely present in undergraduate university studies. The person with diabetes who takes on the leading role in their treatment may understand what is key to the achievement of therapeutic goals, but still has reluctance due to what I like to call the “old school” of medical care—where a patient is accustomed to the doctor dictating goals and the patient obeys without question. This vision is usually coupled with the comfortable sharing of responsibilities in which the therapist takes charge of the success and the patient of the failure. Nowadays, when everything abides by a protocol and evidence on therapeutics is regularly revised and widely spread, we presume that the difference between success and failure may lay with not ignoring the fact that diabetes is lodged in an individual; a person who will have to live with it—as for now—for life and whose fate will from that time be closely linked to their degree of acceptance and ability to optimally live with it. Myths, fears and preconceptions are usually the threshold that must be overcome before adopting treatment. In the way towards achieving the goals of good diabetes self-management, there is a first fundamental step: motivation. We can prescribe state-of-the-art medication, the best meal plan and physical activity program, “flood” the patient with booklets, lectures, advice, but if the recipient of our efforts is not adequately encouraged, we are doomed to failure. In this context, group education emerges as a valuable therapeutic tool. August has arrived. Paulina and Camila are two 8-year-old girls from a small town in the province of Cordoba, Argentina. They will meet again with little Ana, Valentina and Marcos, of the same age, but coming from distant places around the country. They will also probably meet this other boy, the one who would not inject himself with insulin despite his mother’s desperate requests, but who dared to do so for the first time during that lunch, under the supervision of that nice doctor, who was dressed, like all the other ones, without her white coat. Diego, who is 16 years old, learnt that he had type 1 diabetes two weeks ago. He had never imagined diabetes would give him the chance to make friends who understand him more than anyone else, to exchange fear for knowledge and to build hope by meeting so many people who have diabetes and live a long and full life. Like Eduardo, 89, Lilia, 86, who feel they still have things to learn, in addition to having the perfect excuse to get away from their routine for a weekend. In the case of Jorge, Nicolás and Cecilia, who were diagnosed with type 1 diabetes in their teens, adulthood found them helping their peers as physical education teachers. Judit and Andrea, both mothers to children with diabetes, have decided to express their gratefulness for what they have received by becoming another link in the chain of emotional support for those families that are introduced to the difficult art of staying positive. Alba, Teresa, Susana, who are “in their sixties,” are as enthusiastic about storing their metformin and their insulin containers in their bags, as they are when they get dressed up to go to a party on a Saturday night. Federico, who feels he has learnt so much as a little boy, will have the honour of wearing his group coordinator vest for the first time. Carlos, Marcela, Zulema, Lidia, among near twenty more, have left their white coats in their medical offices, but not their vocation and spirit of solidarity, and they are fulfilling the commitment of honor they have made. 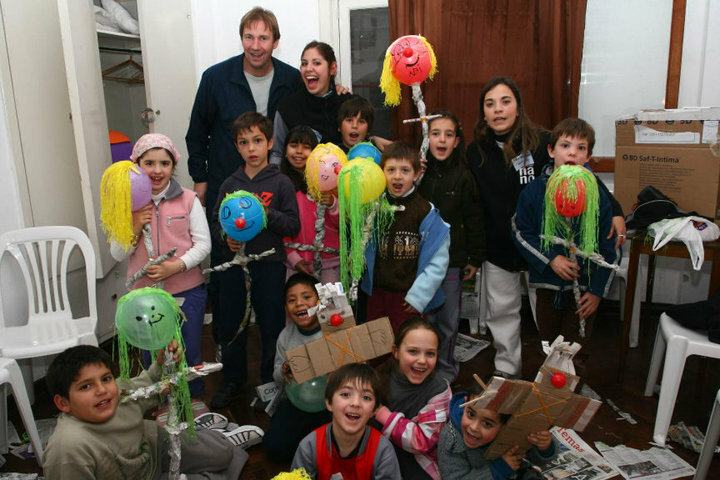 The development of group educational activities within a relaxed framework, with the possibility of interaction with other people coping with the same experience is a task FAD has been committed to ever since its creation 45 years ago. FAD is an NGO made up of patients’ associations and supported by a scientific committee that is composed of a multidisciplinary team of healthcare professionals. The experience of living with diabetes is difficult to convey. Only people with diabetes can truly understand and feel in their own flesh what it means to inject themselves daily with insulin, to have to closely monitor their blood glucose and take the corresponding measures. 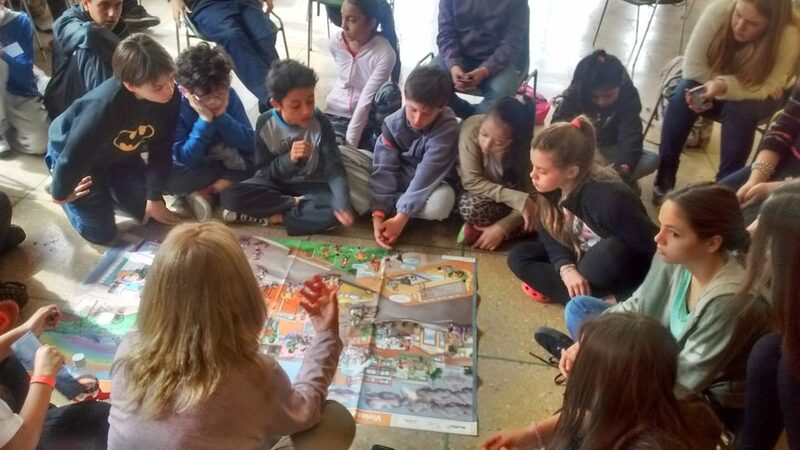 In the belief that self-management groups are an important therapeutic tool, FAD facilitates collaboration with various public and private entities on any activity related to education, quality of life and equality of conditions for all people living with diabetes. Among these activities, their annual meeting stands out. 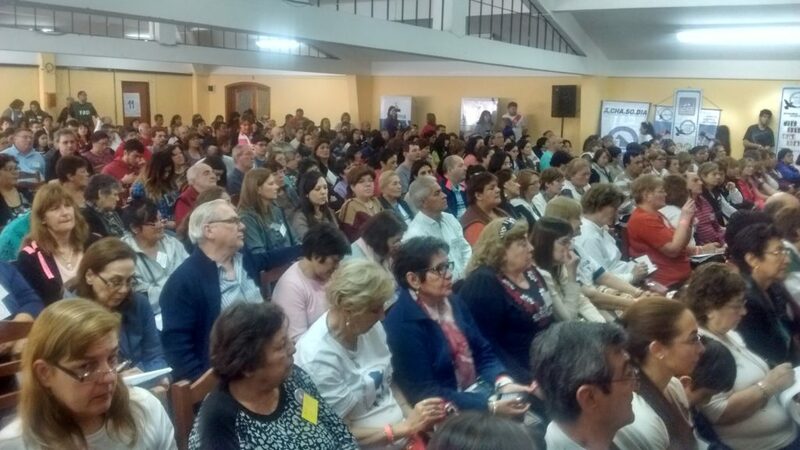 Nearly 800 participants from all over the country and of all ages, gather together for four days in a tourist facility located at the center of the vast territory of Argentina, to facilitate access for everyone. Groups from both crowded cities and small rural towns, enrich this event with their diverse customs and regional accents. Everyone participates with the goal of learning within a friendly and relaxed atmosphere. Workshops on different topics of interest are organised, arranged by type of diabetes and age, as well as groups for family members. A medical specialist is available to each group. Topics are adapted to participants and there are two coordinators in charge of recording the blood glucose readings of each attendee and keeping them informed of the daily activities, in addition to providing significant support. 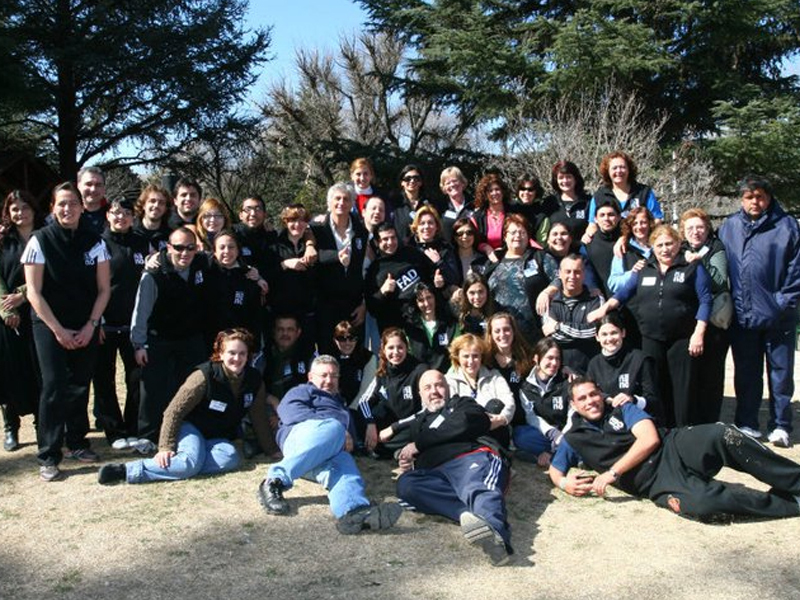 The team of coordinators of the 19 groups is largely composed of people who have once been children or teenagers with diabetes and have attended previous events, and by leaders of the associations that make up FAD. The physician can show one direction, but it is always easier for a person with diabetes to walk along this path when someone has done it before and done it well. They can see themselves reflected in the other and eventually correct mistakes by exchanging knowledge, with the support of a healthcare professional. The feeling of being supported, understood and listened to by a peer who also has diabetes has an added value in the process of learning to live with the condition. Each group shares a table during meals, and this is of particular benefit to children and teenagers who, sometimes for the first time, can self-monitor their blood glucose and inject themselves with insulin openly, thus sharing this experience with those who must do the same daily. A private experience, sometimes done stealthily for fear of social rejection, becomes something that is lived more naturally. Children, who are generally the only ones in their school with diabetes, find new friends who also take insulin as they do. A teenage girl will be able to have a conversation with an older woman who was able to get pregnant and have children successfully. Someone who has recently been diagnosed with diabetes can meet people who have learnt to live with it many years ago. Little children surprise their parents when they show them they can give themselves their insulin shot and self-monitor their blood sugar as the other kids in the group do. Meeting other people who have lived through older age with diabetes encourages them. These adults, in turn, when they eventually need to inject insulin by themselves but postpone this for fear, or leave these injections in the hands of others, are involuntarily inspired and encouraged when they see how easily these children do so. When it comes to initiating a new therapy, listening to the experience of another person who has already made the decision and understood its benefit has a strong impact contributing to acceptance and adherence. Beyond the patients’ trust in their physicians, since “biting a chili pepper tells you more about it than planting a field of it”, the concept that personal experience is the best teacher, prevails instinctively. The experience of living with diabetes is difficult to convey. Only people with diabetes truly understand and feel in their own flesh what it means to daily inject themselves with insulin, to have to closely monitor their blood glucose and take the corresponding measures. This is why the team of coordinators is largely composed of members of the young sub-committee of FAD who live with diabetes. They have once been children and teenagers, have attended previous events and have decided to undertake the commitment of giving back what they have received, with the special sensitivity that having this unique knowledge brings. The healthcare professionals who take part as educators and who are responsible for the groups, are selected following strict evaluation, with consideration of their suitability, teaching vocation and community work in the place where they live. Both they, the organising team of the event and the group coordinators, volunteer their time and efforts and receive nothing else in return, other than the satisfaction of a job well done, the grateful hugs of participants and the promise to meet again next year. This type of event emphasizes the value of group education as a resource that supports patients and families, and fosters empowerment and success with diabetes. It is a strategy that, year after year, FAD urges not to ignore. 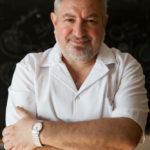 Gabriel Lijteroff is a Specialist in Internal Medicine and M.Sc. Diabetes Chief of Diabetology at Hospital S.T. de Santamarina, Monte Grande, Buenos Aires, Argentina. He is Director of the Scientific Committee and Ex-President of the Argentinian Diabetes Federation (FAD) and a member of the Executive Committee of IDF SACA management 2018- 2020.